"I think, Sebastian, therefore I am." I'm a Weaver of Creativity, and love everything to do with the arts. I'm hoping to become a published artist, and writer; along with working with my art group, on graphic novels, music, films, and other projects, as well. For fun, I play video games, namely almost everything by Nintendo, as well as fighting games; Soul Calibur, and Tekken, by Namco - and another old time favourite: Castlevania, by Konami. I also like to watch old television shows, and old movie classics. My taste in music is generally that of '70s-'80s, along with beautiful music, such as Irish/Celtic, medieval, and classical symphonies. Someday, I hope to become a freelance artist, and be able to draw concept designs, and promotional artwork for video games; other than the games my art group plans to design someday. ...I'm also a replicant, known as Pris. 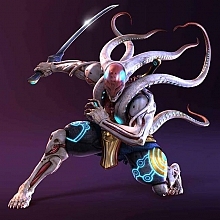 I'm writing a series based on the Manjitou of both Soul Calibur, and Tekken; featuring our beloved Yoshimitsu, and of course, his faithful Manji clan, including Soul Calibur's Ukon, Sakon; and my custom created character, Shadowmitsu (or Sha-mitsu, as Yoshi-san calls her, which is her birth name,'); along with Kunimitsu, and an unnamed male Manji member, for the Tekken stories, which are currently under development, at the moment. You could all just call me Pris, though; even if my screenname is taken from my homemade character. welcome to YOT "Sha-mitsu"!!!! HELLO! yoshimitsu8861 : welcome to YOT "Sha-mitsu"!!!! HELLO! Hehe, someone else's been watching Blade Runner, too. Have u got a deviantart account or could u show us some of ur work? I´m really curious about it. That would totally rock. I´d love to add my own Tekken character to the series for example hehehehe ^^""
Hey, have u got one of those boards (dunno the name) on which u can draw on and it´s pluggend into the comp? drawing yoshi concepts/ pics?, post them here at YOT!!! thatll be verrry cool!!! yeah! and, a freelance artist! very nice! Welcome, Sha-mitsu. I hope that soon we'll have the pleasure of seeing your arts. I like watching old tv too, (How far are you going back?) and like just about anything traditional or that has a bit of history to it. I get some kicks when watching Eddie Cantor, laural 'n' hardy and I LOVE watching various old cartoons and Laugh-O-Grams. Ahh.. Those were the days when tv taught a moral - If not propaganda LMAO. My fav artists are Max Fleischer and Walter Lantz <-- Kudos to him!!! Anyways, I've read everyone's fan fiction on this site. I am most excited looking forward to reading yours! Yo yo welcome to the Manji clan. Another artistic one I see. I'm getting jealous of you guys, wish I was artistic lol. Kogamitsu : Hehe, someone else's been watching Blade Runner, too. Oh yes, I love Blade Runner. Roy Batty's my hero! ^_^ And I can definately relate to Pris, with the eccentricity, and childlike mannerisms... I'm quite the strange one, I suppose. (And it's rare for me to have a character to be able to relate to so much, lol). Thankyou, I'm glad I have my brothers, and friends, to help me out with those projects, hehe. I'm not sure if linking to them would be allowed? Yes, it's fun to work on concepts... I'm still trying to get the hang of backgrounds - so far, I think that my brothers have been most impressed with how I colour/draw... wheat... you know, the gold fields on farms; since I've used that for a couple of backgrounds now. 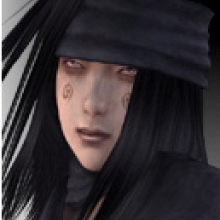 Anyhow, I'd love to see your Tekken character, as well as read anything about them that you may have already written. yoshimitsu8861 : drawing yoshi concepts/ pics?, post them here at YOT!!! thatll be verrry cool!!! yoshimitsu8861 : yeah! and, a freelance artist! very nice! Tenshimitsu : Welcome, Sha-mitsu. I hope that soon we'll have the pleasure of seeing your arts. Thankyou, I'll try to post some things here, if I may. Most of the projects aren't online at the moment - my brothers, and I, are still working on revamping our website (webserver has a blasted virus, so we're moving that soon :X,'); and most of our projects are on the old family computer's harddrive, but that computer... umm... melted in the fire we had last November (which was the start of most of the stress; but I do not want to go into that). What game did you work on? I'm curious about checking it out... is that the company you worked with? ATD 'Rollcage Firebugs'? I hope you don't mind me asking so many questions, hehe. ^^; And I would mostly like to do freelance - I don't think I'm much for committing (longest I would imagine working on a project, would be... erm... a year, or so; but I'm not entirely sure how it works). Grey : Yo yo welcome to the Manji clan. Hehe, don't be jealous! Be inspired. Besides, anything that one puts their heart, and soul, into - is an art, in it's own right. Forgive me, I'm partially Native American, so I believe strongly in everything having it's own spirit, as well. Anyhow, I want to thank all of you for the warm welcome (and apologise for this long post X_x), so... thankyou all. Oh, I have lost a lot of creativity through stress. Now I don't know what to do with a blank canvas - I just sit and stare at it.. then get browned off. I'm gradually losing the ability to paint and draw. I'm sure soon this will all change. I used to fall asleep at the computer all the time. Was bad for me, and contributed to the mindless/creative less state I am now. Take a break! SumSamurai : Oh, I have lost a lot of creativity through stress. Now I don't know what to do with a blank canvas - I just sit and stare at it.. then get browned off. I'm gradually losing the ability to paint and draw. I'm sure soon this will all change. Stress is really not good for creativity... it's an absolute killer on many levels. :X Anyhow, I'm trying this thing; where I'm going to be taking music - songs, lyrics - any sort of inspirational themes, to try to make artwork, stories, projects inspired from those themes that inspire me... which is actually how I got started on my current Manjitou story - I took a song, and used it for inspiration; although, you probably wouldn't even be able to tell, unless you were familiar with the song, because I did not write it in the typical 'songfic' style. You should try something like that, it could help - like paint while listening to a song, or with a certain song in mind (or any subject at all), and hopefully that could produce some creativity of the moment. I just use music as an example, because music is so powerful, and inspiring. Bad thing about working on my laptop late at night... laptop's right next to my bed, and I don't even have to get out of bed to work. So, I was writing, I got to the second paragraph... then I rested back a moment, to take a break, and was thinking to myself, 'I'll just take a break... while Yoshi-san runs through my computer files... and I'll just... zzzzz..."